In playoff games, especially in basketball, one should always expect the unexpected. 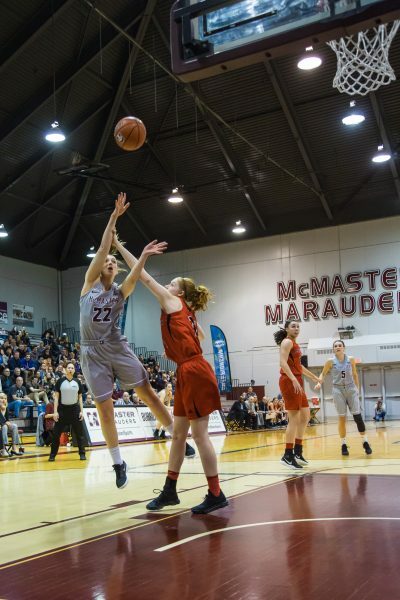 The McMaster women’s basketball team experienced a little taste of their own “March Madness” during the Ontario University Athletics Critelli Cup playoffs. Leading up to the playoffs, the Marauders proved to not only to those watching but to themselves what they were made of. When several key players graduated at the end of last season, it was up to the mix of new veterans and younger players to step up to the plate. That cohesiveness began to solidify over the summer when the team went to Taiwan to compete in an invitational tournament. “Having that stress-free time to play basketball with no pressure to win gave us more time to really bond and have fun with one another,” said Harper. As the season went on, and the wins began to increase, this bond only became stronger. The team’s handwork in the regular season was recognized as Hanaka was named an OUA First-Team All-Star and Harper an OUA Third-Team All-Star. First-year guard Sarah Gates was also recognized for her efforts, being named to the OUA All-Rookie Team. “I knew I was having a good season but you never know with awards, so it was really a nice surprise,” said Gates. With a regular season record of 20-4, the Marauders sat in first place in the OUA West Division by season’s end. 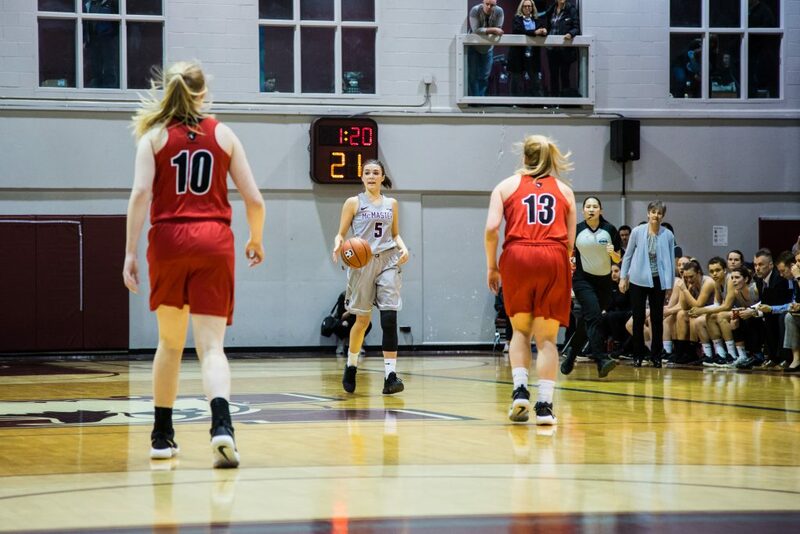 After a well-deserved bye in the first round of the playoffs, the team regrouped to defeat the University of Western Mustangs 61-51 in the OUA quarter-final match. 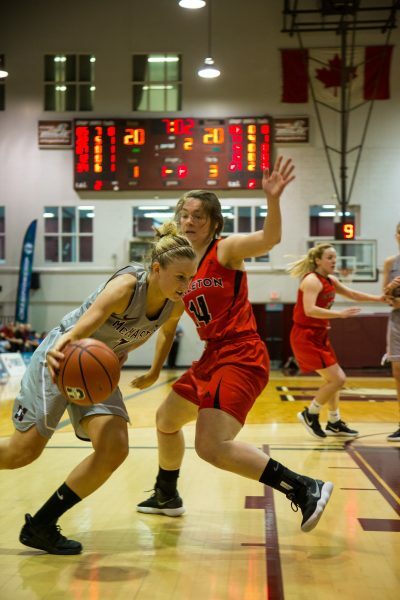 The playoff madness began when the Marauders faced the University of Ottawa Gee-Gees, a team they had lost to by just two points earlier in the season. Going into that game, one of the Marauders’ biggest problems was the size mismatch with the Gee-Gees’ 6’5” forward Angela Ribarich. “We knew we had to double her when she had the ball in the post and get them to prove that they can make their outside shot,” said Harper. Brigette Lefebvre-Okankwu also posed a threat with 14 points, 11 rebounds and three steals, while guard Brooklynn McAlear-Fanus contributing 14 points of her own. The Marauders were ultimately able to pull away with the win thanks to Harper nailing both of her free throws in the last eight seconds of the game, sealing a 47-46 Marauder win. That roar of the crowd was the cheers of hundreds of McMaster athletes, students and supporters in the stands being the perfect soundtrack to the nail-biting win. “It was a redemption game because we fell by only a few points the last time,” said Hanaka. The win against Ottawa meant that for the first time in 11 years, the Marauders would host the Critelli Cup final with the undefeated Carleton Ravens as their opponent. The Marauders hoped to give the Ravens their first loss of the season, and by the end of the first half with Mac up 36-28, it looked like they could pull it off. But after the break, the Ravens came out strong with a 12-0 run and managed to stretch their lead. By early in the fourth quarter, Mac had managed to bring the deficit down to two at 55-53, but unfortunately, Hanaka, who was already at three fouls, committed her fourth. Making the obvious but tough choice, head coach Theresa Burns took her out the game and the Ravens were able to bring the score back up to 60-53 before she returned. When she returned at the five-minute mark, she played carefully so that she would be able to contribute in the best way possible. With Hanaka back in, the Marauders managed to bring the deficit back down to a five, but unfortunate fouls from Mac and proficient shooting by the Ravens lost them the game. Though the Critelli Cup final did not end how they would have wanted, the Marauders are still grateful to be in the position they are in. Making their first appearance in the national tournament since playing host in 2011, the U Sports Championship hosted by Regina is the next challenge for the Marauders. 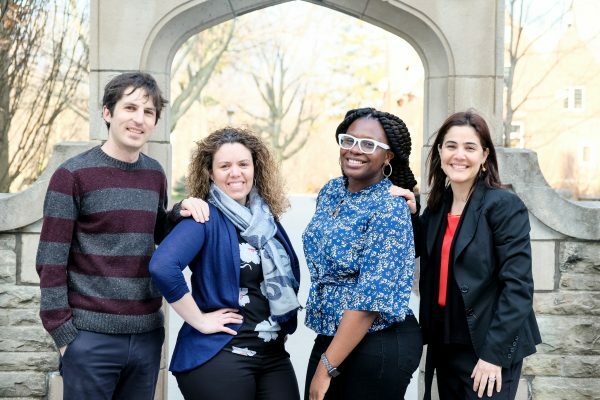 With the tournament schedule set, the Marauders will face McGill University’s Martlets to start the competition. The quarter-final match up will be the first time the two teams will face each other since Mac lost 59-70 in their first preseason game. Five months and over 20 wins later, the Marauders are more than ready for whatever nationals has to offer them.